With many flowering trees, routine pruning is the price you pay for beautiful blossoms. But magnolia trees (Magnolia spp.) generally prefer that your pruners stay at rest. 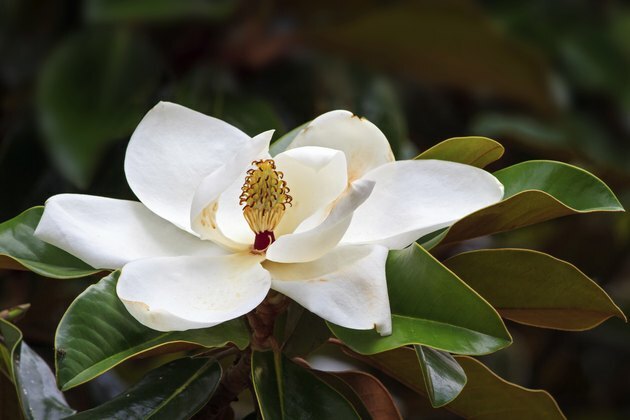 With varieties hardy from U.S. Department of Agriculture plant hardiness zones 3 through 10, magnolias stay healthier and look better the less pruning they receive. Whether your magnolias are deciduous or evergreen, limit pruning to the essentials. Proper timing depends on why you're pruning. Magnolias deliver beautiful blossoms without regular pruning. Never prune magnolias routinely. Mature trees often respond to pruning with what are called water sprouts: Vigorous, energy-draining, vertical shoots spring up along horizontal branches. Branch tips often die back, and magnolia health and beauty suffer. Prune only for problems, such as wind and ice damage common to these soft-wooded trees. Prune broken limbs right away to reduce shock and wasted energy. Dead or damaged wood, suckers along a tree's base or trunk -- and any water sprouts -- can be removed any time of year for deciduous or evergreen magnolias. Young magnolia trees benefit from limited pruning to establish their structure. Do this as early as possible in the tree's life. Whatever the schedule in your climate, do formative pruning at planting time. Remove dead, damaged or crossing limbs, and shape up errant stems. Mature magnolias heal slowly. Pruning young, small limbs avoids larger wounds later on. Even so, keep pruning minimal. Branches on some magnolia trees start low on the trunk. The effect can be beautiful, but remove low branches at planting time if you want headroom under mature trees. If overgrown magnolias need rejuvenation, midsummer is the best time for major pruning for deciduous and evergreen trees. Magnolias tend to "bleed" when pruned in late winter or early spring, when sap flows. The tree isn't hurt, but dried sap detracts from the tree's beauty. Magnolias shock easily and recover slowly from severe pruning, so spread the process over several years. Thin trees by removing select branches entirely. Pruning all the way back to the main trunk or strong side limbs helps prevent water sprouts. Rejuvenation can be done with the tree fully dormant in late winter, but you may risk sap. Primping and pruning won't improve magnolia flowering, but improper timing will rob you of elegant blooms. If flowers are your main goal, keep blooming times in mind. Spring-flowering magnolias set those flower buds during the previous summer. Prune them immediately after flowering, before they set buds for next year. Late-season pruning sacrifices blossoms. For magnolias that bloom in late summer and fall, flower buds form on new growth from the current season. Prune them in spring -- after the sap slows and before new growth begins -- to encourage new stems. Whenever you prune, proper tools make pruning easier on you and your magnolia. Sharp bypass hand pruners work well for small branches less than 1/2 inch in diameter. The bypass action provides crisp, clean cuts that help wounds heal faster than other pruner types. Sharp bypass loppers work best for branches up to 1 1/2 inch in diameter. Branches over that size call for a sharp pruning saw. Avoid spreading disease by disinfecting your pruning blades with household disinfectant before and after pruning your magnolia. Wear gloves, protective clothing and protective eyewear when you prune.